Boeing 3Q earnings call Oct. 24, 10:30am EDT. Oct. 23, 2018, © Leeham News: Boeing has been confident it has bottomed out the production rate of the 777 line, successfully bridging between the Classic and the X models. But during LNC’s trip last week to New York, sources said this bridge may be moving to the right. Etihad Airways was a launch customer for the Boeing 777X. It’s deferred delivers once. It may do so again. LNC has been on this story since January 2017. Image via Google images. Seventy-two percent of the 777X orders are with the Big 3 Middle Eastern Airlines. As far back as January 2017, LNC began reporting quiet deferral of 787s and 777s. See the stories here, here, here and here. We’d reported that Lufthansa was considering deferrals as well. Bloomberg also reported this Monday. The upshot: Market sources in New York indicate that the production bridge is shifting to 2022-2023 from 2020-2021. Boeing is once again pushing sales of the 777-300ER to fill this bridge and maintain the production at 5/mo. Furthermore, other market information indicates Boeing may be considering new-build 777-300ER freighters as a way to also build this bridge. Boeing may well be facing a problem with the 777 bridge—and the 777X program—that the market hasn’t tumbled to yet. The 777 to 77x bridge is fine. 77x production rates past the first year are indeed questionable. Every dog has its day, and the 77W certainly did have a few, but I can’t see another year or two worth of pax sales. I don’t think even late 90’s Leahy could pull that off with 78J and A359 availability in that 2021-22 window, unless Boeing agrees to taking back older 777 frames of various types at huge trade in’s for conversion to freighters. With all the buzz regarding the Middle East, it is easy to understand that several of these orders may be cancelled. It also seems that, while the A350 is already proven and flying, the 777X is still with some challenges regarding weight and much more important, regarding market size to pay for them. Etihad is almost gone, Qatar as several limitations. Perhaps a smaller, less expensive OPEX aircraft fits better. Challenges with weight? According to Wikipedia (I know, I know) and my own dubious interpretation of figures that cannot be directly compared (an even worse crime), the A350-1000 MTOW is 316 tons vs 777x-8’s 351 tons, carries about the same number of passenger about the same distance and seemingly quite a lot of cargo to boot. If I have successfully made a valid comparison (and I admit the odds aren’t great), the A350 is a comparative featherweight. That has got to show up in the operating economics, or Boeing’s margins. I think it notable that the last “sale” (if we can call them that) of a VLA from either Airbus or Boeing was A380s to Emirates. I know that Emirates is a special case, but that can’t bode well for the 777-x if they chose the great big 4 engine monster with its nearly yesteryear turbofans instead of the fresh and newly designed Boeing. What if Emirates cancel all their 777-x and buy a load of A380s instead? Unlikely, perhaps, but it’s not impossible. A better number than MTOW is MEW -manufacturers empty weight- which according to an AW story for the A350K was 129 tonnes. The EOW/OWE a slightly different measure for the B777-300ER is 168 tonnes. The two planes are roughly the same length and wingspan. Thats 40 t difference. Seats and galleys and entertainment gear etc all add extra weight and of course fuel volume , which is the always the same density, is for the flight intended. 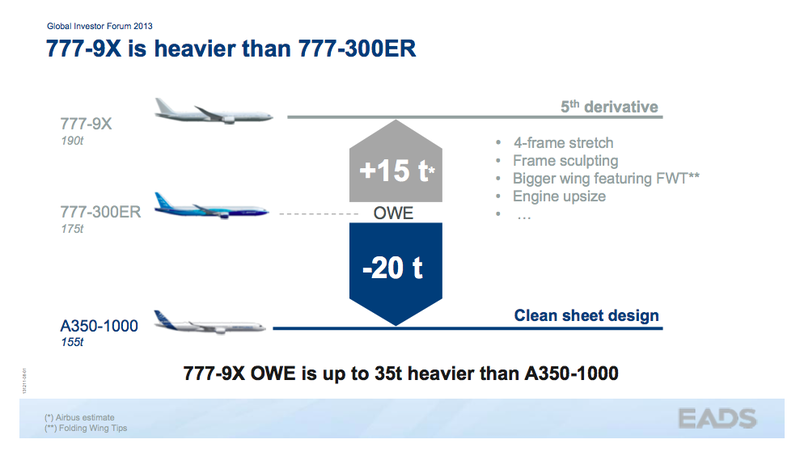 With the new GE9X engine maybe a bit lighter and with a bigger carbon wing on say the 777-8X also heavier, maybe other savings as well, its hard to see the difference getting much below 30 tonnes. That is just for a plane sitting on the ground, in the air the fuel used per passenger is likely what counts. Thanks Dukeofurl, MEW number is not easy to get, are there any good sources for this data. Interested amongst others to compare MEW’s for the 789, 339 and 359. Real world range is not supposed to be same between 777-8 & A350-1000. It is only Airbus using unrealistic spec calculations. 777-200ER, 777-300ER & 787-9 have flights which are near specs. There is no Airbus plane that flies to its specs. Total non-sense. The A350 beats it’s specs. Don’t know about the A320NEO, but they sold 6000. Same A330, don’t know, but they sold 1500. So probably ok. The 777X is totally dependent on the ME big 3. Even more than the A380. So POTUS better says nice things about Arabs. Even if Airbus marketing is off by a land slide, the 777X weight thing isn’t going away. Qantas was politically mentioning it as a question mark. According to this link WOW flew from Iceland to LA with an A321NEO (not LR), that’s ~3700Nm and over spec, don’t know the circumstances. As said, the 778 weighs ~30T more than the 35K, you can’t take that away, its the equivalent of 300 pax with luggage. Also, an A350-2000 most likely to weigh 25-30T less than the 779. Lastly SAA is flying for many years from JHB, a hot an high (~1700m) airport, to NY (7000Nm) with 340-600’s, spec range 7600Nm. @keesje, I think you are deliberately misinterpreting what he means. what he is saying is that Boeing’s claimed range figures reflect a more realistic aircraft configuration and use case (including realistic aircraft configurations and fuel reserves), where Airbus’s numbers are basically max theoretical range in a stripped down configuration with minimal pax and no fuel reserves. you see this all the time when Leeham (and others) normalize configurations and rerun the numbers and the “real world” ranges come down for both (because boeing cheats a little too) but come down more for Airbus vs the marketing materials. for example: the Boeing 777-200LR, which Boeing calls a 317 seat aircraft, as used on QR921, the second longest flight in the world, carries 259 pax 9,000 miles against prevailing winds (Aukland-Doha). the Airbus a350-900ULR (which Airbus calls a 325 seat aircraft), used on SQ21 can only carry 163 pax 9500 miles on the largely wind neutral (almost directly north south) Singapore-Newark route and they have to deactivate the front cargo hold entirely. Pax only, no additional cargo. is the 777 heavier than the A350? you bet. but it is also more capable of carrying larger payloads long distances with fewer restrictions. Now I know Singapore has a good idea they can make money, but it also shows the limitations of an aircraft that works outside its real normal money earning envelope, ie you give up passengers for fuel. How many routes can you do that on? The B777-200LR as used on Doha-Auckland is a 259 seater ( 2 class) as listed on Seatguru. If Boeing is saying its a 317 seats that seems to be an outlier as even Delta only goes to 291 seats. What that doesnt tell us is how many rows are deliberately left empty, I have seen this on a single aisle for a 5hr+ flight so Im sure it occurs on other airlines which switch their planes between longer and shorter flights. Also consider that the ‘marquee’ ultra long distances can involve additional fuselage tankage – B777-200LR , or even A321 but apparently not on the A350-ULR. There is a difference between miles and nautical miles. Auckland to Doha is 14.529 km, 7.850 nm or 9.030 m.
“Range” for A350ULR is about 9.700 nautical miles. Distance Singapore to New York is about 15.350 km, 9,500 m or 8.300 nm. @mhalblaub – yes, I know the difference between M, NMI and KM. so, what exactly is your point? I didn’t mix my units. I didn’t get the seating numbers wrong. A350-900ULR, 9500 MILES, 163 SEATS & no cargo. look at your own post, you mix the order of the numbers to make it look like I misposted. Could Boeing use the same ‘financial engineering’ for the B777F freighter that it used for the 747F, ie build the planes to its own account ( Boeing Capital Corp) but then lease them at market rates that maybe a low financial return. Overall its a good way to cover a short term gap. They might, and it makes sense in some ways. If one can keep the shop open, lights lit, staff working and maintaining proficiency, all whilst making some sort of return, that’s potentially a whole lot cheaper and faster than mothballing the plant and laying off the staff and attempting to reactivate it later on. Plus if someone in the meantime does happen to place an order, one is well placed to deliver it for a decent margin and timescale (both big factors in the likelihood of a sale being made). And you’ve a pool of people and plant to re-purpose to making 737s. Bloomberg is giving numbers for the entire Lufthansa Group fleet, not just Lufthansa Airlines. Getting to aircraft numbers in the Lufthansa Group can be confusing. Below a link to some info to the major airlines fleet in the group. Looks like around 20 A340-300’s, the 340-600’s being replaced with A359’s. Around 40 A330-300’s and 10 A332’s, Austrian still operates 6 B767’s. That means that around 75 wide bodies need replacement. Current 772 and 77W’s in fleet 16 excluding 777F’s. Lets assume that LHG orders 25 more 350’s, possibly including some 35K’s. This still leave 50 aircraft for replacement. This could be a big test for AB and the 330NEO’s, 788/9’s will fit in well with Eurowings and Edelweiss and could find their way into the rest of the LHG fleet? Would not surprise with a LH split buy like Singapore with A350’s for LH/Swiss/Austrian full fare flights and 787-9/-10 for the lower yield Edelweiss/Eurowings/Brussels/Sun Express wide bodies and on routes with no competition where you can squeeze in pax. The 777-9 offers airlines a good option as 747 replacement, if you don’t need the capacity the 35K will offer you potentially lower sector costs and good range. The 35K is now claimed t0 have a range of 8400Nm, Doha to Auckland is ~7800Nm, will be interesting to see if Qatar give it a try? An 350-2000 (+40 seats) with 6500-7000Nm range (MTOW 310-315T?) should be good for most of the routes where airlines operates 77W’s in high density layout, seat mile costs of an A350-2000 should be very good. Whilst boasting the virtues of the a350 1000 . Take out Iran Air,and Ethiad ,which looks like a given, leaves them with a paltry 137 orders in backlog. Clearly that should be next on your agenda of a program in dire need of a boost…!! The ME not a great story for the 35K if you include the 20 cancellations from EK. Believe that when replacements of 77W’s start we can see a significant portion of that going the 35K’s way, especially with airlines currently operating 359’s and 77W’s. Still believe there is an opportunity for AB with an A350-1000X with 6500Nm (effective) range, ~290T MTOW, 359 wing and thrust of around 88Klb? Apparently the XWB84 with PIP’s will have a thrust capability of up to 90Klb. By historical standards the 777 is fine number wise. Its the limiited market and such a huge bias to the ME3 that is of concern. I am also seeing Qantas and Thai make statements that they are replacing 747-400 with 787. That looks to mean a more flexible mid size wide body deployment wise vs a bigger twin that is not as flexible. The 777x will have short production life (e.g. less than 10 years and will go the way of the A380….Boeing got it right with point to point strategy with the 787! What we see is a major airport to miner ones, not the mid level to mid leave. Examples are Japan to Boston and Japan to San Jose. So its only partial pointing as it were. They have opened up routes that were not economical before doing that so its working. It is dishonest (fluff, spin etc) to say point to point as is presented. Most 787 flights are on routes that existed before and are between major hubs. You need to distinguish an advertising strategy from what is actually happening, the point to point claim was the exact wording used by Douglas in the late 60s to drum up sales for its DC-8s against the new 747. The P2P idea doesnt always work for passengers as you might have 1 flight per day where as going via hubs means its both cheaper and you have a bigger choice of departure/arrival times. Agreed Most 787 are not, but they are also opening up new routes. Just not point to point. Overly dependent on one entity is not good for any aircraft, be it A380, 777X or anything else. A330NEO is in the nebulous hands of Air Kick the Orders down the Runway Asia X. Single aisles by their natur5e are spread out so loss of any combo is not going to hurt. 777X does have that issue and you can’t disregard it. As noted, the volatility of the POTUS plays into this as we see from the current Saudi crisis preceded by an needed Iran crisis. Big question is where does a 777-300F really fit in? Supposedly the reason they put the 777F on the 200 form was that was the right balance. So is the 300F only a FedEx/UPS/DHL variant? And do you shoot down the 747F line to make more 777s? Of is this flailing in the wind like a Freighter NMA for FedEx when they have 757s and gobs of 737s they can use in the future? Yes. Thats an unusual approach to be talking about -300ER freighters. You lose some heavier deck capacity as OEM freighters have strengthened main deck beams to take the higher cargo density pallets. Doesnt mean the -300 version cant have that too but it adds to empty weight. You would think theres plenty of high hours -300 versions about to out of airline service that can be converted at low cost to carry low density packages for the online shopping boom. Maybe its another niche in Boeings cargo strategy that means they retain their dominance. Boeing is talking about 777-300ERF all new build, not the older aircraft. Airlines kept the old 777s and re-deployed them. Ergo, FedEx went with new 777-200ERF as the initial feed stock to come from Singapore got moved over to Scoot until the 787s arrived. Boeing will keep the F market but conversions are not selling new aircraft. Used are a balance of what it cost to convert vs how much use you get out of them including where engines are at in the life cycle and the hull on its inspections. Its not a B777-200ERF ( the 777F) its the HGW -200LR made as a freighter version. The 2 planes: 200LR and 200F are HGW siblings (348T ) while the 300ER is XHGW ; 351T . By comparison the 200ER model is 300T MTOW. Wow, lot of information in this one. Etihad is likley to cancel all of it’s A350s. That would be a huge blow to Airbus, loosing one of it’s biggest A350 customers with 40 A359 and 22 A35k on order. It would also be weired, as if you are a struggeling airline having issues with utilization, you would cancel your biggest airplanes on order for smaller ones. So in fact, you would expect to cancel the B777x order and downsize on a core fleet of B787 and A350. The issue being utilization, the smaller the wide body the more flexible it is. The 300ER obvioulsy hit a sweet spot in the market. The 777X may have boxed themselves into a far more limited one. 747sP and A380s are not selling. 777X is a capable 747 replacement but people are replacing 747s with 787s! There clearly has been a shift. A330NEO to me is a question mark as it is heavily dependent on Air Asia famous for kicking orders down the runaway. So no, for flexibility the smaller wide bodies work. So then its a matter of go with what you have or something new? I can understand if they cancel the 359’s as a combination of 789’s and 78J’s can do what the 359’s were intended for. The 35K’s could make sense as their large long range aircraft potentially replacing 77W’s over time. Four of their 77W’s are 12 years old, the remaining 15 relatively new. That’s what make me worried in this article. Why should Etihad cancel it’s smaller A350s – as their feeder strategy has fallen appart and they can’t fill larger aircrafts anymore? If they cancel the large and close to delivery A350 order, it doesn’t make sense keep up their B777x order, unless they phase out their bigger A380 and early B77W. The other option is there’s no strategic perspective, and Etihad is doing everything to enable a merger with Emirates – but would the A350 prevent this? Don’t think so. For me it would be more senseful to base the new fleet around B787 and A350. The B789 replaces all the A330, there’s demand for used A330s. B78T is a nice plane to fly Europe – Abu Dhabi and closer destinations in Asia while a reduced number of A359 can take over longer routes to America, Australia, Asia (Japan) , with the A35k offering more seats and potentialy replace the B77w. I see all of the A380s out of their fleet, also the few B777-200lr (maybe they buy a few A359ulr?) . A380s will be replaced by B779, so maybe 10 or 12 of that order can be maintained and postponed till the A380 can phased out, the A350 orders will be stretched till the B77W is up for replacement. I can’t see any scenarion how Etihad will sucessfully fly 40 B789, 30 B78T, 40 A359, 20 A35k and 25 B777x, even if they retire all their A330s, B772s and A380s. The A350-900 has about seating capacity of a 787-10 but far more range. Therefore a 787-combi can’t do everything an A350 could. May I mention that Ethiad is not based at a cool location. This will reduce range for any aircraft. The maximum range is passengers and their baggage only, any extra cargo reduces range or if the range isnt needed fuel is reduced. As the 787-10 has less maximum range to begin with any reduction in takeoff weight ( essentially the fuel) will reduce range even more. Singapore Air essentially uses the 787-10 as regional aircraft for the intra Asian high density routes so from Gulf locations ‘regional type flights’ could be to India/Pakistan/Iran and to Europe on the other side including Egypt and Turkey. Temperatures in the ME is going to impact the 78J’s range that’s why I wonder if EK is re-thinking them. A359’s will give much more flexibility in these conditions, interesting is that Etihad has(d) 40 x 359’s on order and EK’s L.O.I. is for 40 x B78J’s. Also, EK’s competitor Qatar is flying 350’s which by all accounts are well received by passengers.